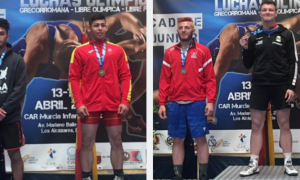 Monday Roundup: USA Cadets Kill It at Pan Ams; Italy Wrapped; "Akron Week"
First and foremost, we acknowledge today the servicemen and women who throughout our country’s history gave their lives so that precious, peaceful freedom may forever endure. To the families, friends, and loved ones of those lost, we are always with you. To no one’s surprise, the Team USA Cadets picked up a mighty haul of hardware at the Pan Ams this past weekend in Guatemala City. Led by gold five gold medalists, the Americans, many of whom possessing significant age-group experience, found little trouble running away with the team title over Mexico with 215 total points, good for a 25-point cushion when it was all said and done. Carson Manville (65 kg, VA), the incredibly-skilled younger brother of 2017 US Senior World Team member Mason, donkey-stomped to his second straight Pan Ams gold on the strength of three blitzing tech falls. 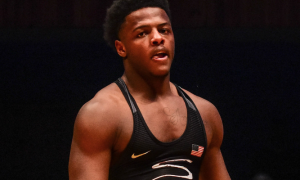 Sheldon Seymour (48 kg, PA), who impressed onlookers a few weeks ago in his home state when qualifying for this event, sewed up his title with a fall over Guatemala’s Pablo Tacam Cua. Fellow Keystone State wrestler Gerrit Nijenhuis (80 kg) steamrolled Daniel Veliz Perez (MEX) in his final, and Chase Thompson (FL — he’s been overseas before) put in some legit work at heavyweight to wrap up his first foreign medal. Of course, Hunter Lewis (55 kg, WI) also grabbed gold. Like Manville and Paxton Creese (51 kg, MN, and mentioned below), Lewis’ success is not at all surprising. For several years now, Lewis has trained and competed overseas, and has used that unusual breadth of his experience to compliment what is an overall polished skill-set. In short, he has won a lot of matches at the international level already and the confidence he regularly displays on the mat is hard to miss. On Friday, Lewis wrestled four matches and outscored his opponents by a combined score of 34-0 with all four victories coming via tech. Creese came really close to making it six American gold medalists until it all slipped away late in the conclusive period. Going up against returning Pan Ams champ Axel Salas Esquivel (MEX), the talented Minnesotan held a 2-0 advantage with under a minute to go when Esquivel was virtually gifted a passivity point and used his subsequent par terre chance to turn Creese with a gut. It was pretty heartbreaking. The good news is that there it really doesn’t matter. 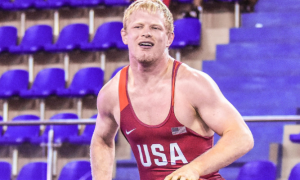 Creese is young, experienced, crazy-skilled, and remains an extremely viable contender to make a World Team coming up (very) shortly. But let’s rewind to why there was nothing even remotely eyebrow-raising about the Team USA performance: this is a regular, if not traditional, occurrence at the Pan Ams (with the only somewhat-of-a-downer this year being that no weights were qualified for the Youth Olympic Games). Since 2013, the Americans have earned 58 medals at the Cadet Pan Am Championships with 33 of those being gold. To put it into deeper context, the past six runnings of this tournament have seen a US athlete earn a medal over 90% of the time. 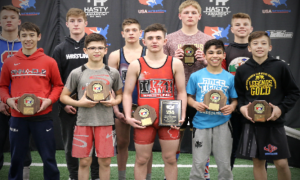 Recent champs have included the likes of 2016 Junior World bronze Taylor LaMont (60 kg, Sunkist), 2017 Cadet World Champion Cohlton Schultz (130 kg, Sunkist), Calvin Germinaro (82 kg), and dialing it back to the first year on the above list, Mason Manville (77 kg, Army/WCAP). But overall, if we are being honest with ourselves here, the overwhelming majority of American medalists at the Cadet Pan Am Championships tend to be moonlighters who only participate in Greco because they have to, which is easy to recognize, as very few of these athletes have committed to the style full-time once their age-group careers are done with. No one is to blame here (not really), it’s just facts. Thankfully, that trend is beginning to ebb in the other direction. Kevin Beazley (97 kg, Cliff Keen WC) and Morgan Flaharty (67 kg, NYAC) had their own reasons for embarking on a cross-Atlantic flight to Sassari City, Italy last week. Beazley, because there was no choice in the matter, wound up a feature story in his own right. 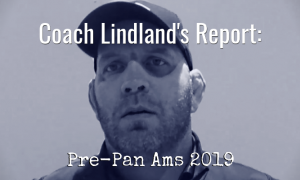 The former Junior World Team member was becoming a consistently threatening presence on the Senior circuit prior to a three-year hiatus that saw him earn All-American status for Old Dominion and endure an elbow injury that cut short his chance for another this past March. That he decided to check back into Greco has raised the sport’s profile a tick, not to mention injected even more depth into a weight class that could always use some more. So, sure, they went about it in different ways. While both entered the tournament as question marks, Beazley was expected to compete well. He has the pedigree. 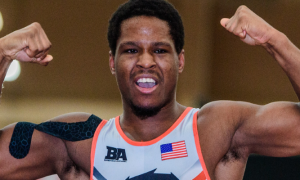 That’s what two Junior World Teams and a pair of runner-up finishes to Caylor Williams will get you in life. You can throw in his collegiate prowess, as well, should it feel necessary to do so. Other than a weird tech loss to Italy’s El Mahdi Roccaro, someone Beazley would likely pummel into the ground with another month of full-time training, he performed exceptionally. The headlock, that headlock, was a useful weapon. And the malice Beazley showed when he yanked Kwon Jeong-Sol (KOR) backwards in their first bout also left an impression due to its improvisational effectiveness (although there is no way he deserved five for the maneuver). Flaharty is a different case. He just doesn’t get enough credit for what he is responsible for behind the scenes. When he is not busy doing all he can to raise his own game, he’s putting his fellow athletes at the Olympic Training Center through a plethora of strength and conditioning workouts. That’s because he also serves as the team’s strength coach, a hefty responsibility to say the least. Not a ton of downtime with that lifestyle it would seem. Flaharty picked up a couple of wins in Vegas last month but came up a round short in terms of qualifying for the upcoming Trials. Therefore, like Beazley, he needed an international medal anyway he could get one in order to book a spot in Tulsa. To compound the entire situation, Flaharty had to deal with a bunch of chaos getting into Italy leading up to the tournament. Traveling to Europe can sometimes be a mess, but because Flaharty was cutting it close — and also cutting weight — there’s no doubt that a built-in excuse could have been made should things have went south on Saturday. But Flaharty kept a great attitude, and though he got a little help, persevered to earn a precious silver. With the US not hosting a “Last Chance Qualifier” for a World Team Trials, the Matteo Pellicone Memoria/Trophee Milone appeared to be a worthy substitute. The level of competition present wasn’t anticipated to be extraordinarily high, and for the most part it wasn’t — although Russia brought several of its stars, such as 2016 Olympic champ Davit Chakvetadze (87 kg) and 2017 World bronze Stepan Maryanayan (63 kg). In fact, Russian athletes won seven of the ten contested weight classes (not uncommon for the powerhouse at this event). But in between, there were plenty of “depth guys” from other countries filling up the rest of what were mostly sparse brackets. In other words, if you were a US athlete who absolutely needed to earn an international medal to qualify for the Trials, this one was as close to being a safe bet as it reasonably gets. Then there was Hancock, who unlike Beazley and Flaharty, had qualified for the World Team Trials long ago and jumped onboard the trip for the sheer purpose of getting some different looks ahead of next month. Was there any noticeable rust? Not so much. Hancock looked to be in excellent condition and demonstrated an opportunistic knack for picking up scores. What is worth noting is how Hancock was screwed over following his win against Kwon. Athletes are allotted 20 minutes of recovery time between bouts at international events according to the UWW rulebook. The tournament called the wrestlers to the mat well before those 20 minutes were up while Hancock was still in the back catching his breath. Apparently, they didn’t feel it necessary to wait for him — and Beazley — standing there looking all sorts of bewildered — got his hand raised. And then next thing you knew, Hancock appeared on the mat to wrestle, but it was already a done deal. Fair enough. But what about the rules concerning athlete recovery between matches? At this stage, it’s all immaterial. A match between Hancock and Beazley might have been a fun watch. There is a slight touch of synergy with those two. Just as Hancock’s ascent on the Senior circuit began, so too did Beazley’s hiatus. Joe Rau (87 kg, Minnesota Storm) took over 98 kilos shortly after — and then when he dropped down and Williams left the sport following the ’16 Trials — the weight class became all about Hancock and Hayden Zillmer (Minnesota Storm). 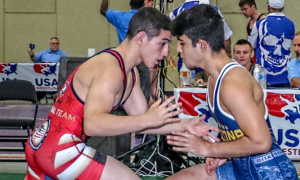 The 2018 Cadet and U23 World Team Trials take place this coming weekend in Akron, Ohio. It’s a little bit of a different thing this year, what with the University age group all but relegated to becoming an afterthought in favor of U23. 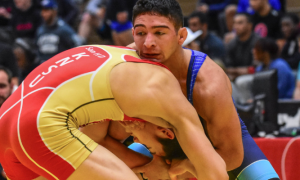 Nevertheless, the degree of importance cannot be understated, as two of the four US Greco-Roman World Teams will both be decided within the same weekend. For the U23 athletes, the potential is there for a lot of incredibly entertaining match-ups and perhaps predictably, several repeat champs. There will be some of that on the Cadet side, as well. We will be outlining both age groups using our Watchlist-style format later on in the week along with our regular coverage. Do You Want Email From US? Due to the official launch of the General Data Protection Regulation (GDPR) late last week, we are asking all of our readers and supporters to read this page. In addition — if you are on the 5PM email list, we request that you please re-submit your contact info and/or update your preferences. Protecting our community from third-party vendors and as well as any nefarious digital sources of exploitation is of our highest priority. It is important that our readers understand and acknowledge that we will never disseminate their information to anyone else, ever.